What a day, this last Saturday! A big THANK YOU to all who volunteered to help us update and beautify the Co-op! We began with some prep work last weekend but this Saturday was the busiest day, with 25+ volunteers helping paint, garden, and set up our new outdoor eating area. See our photo gallery below! 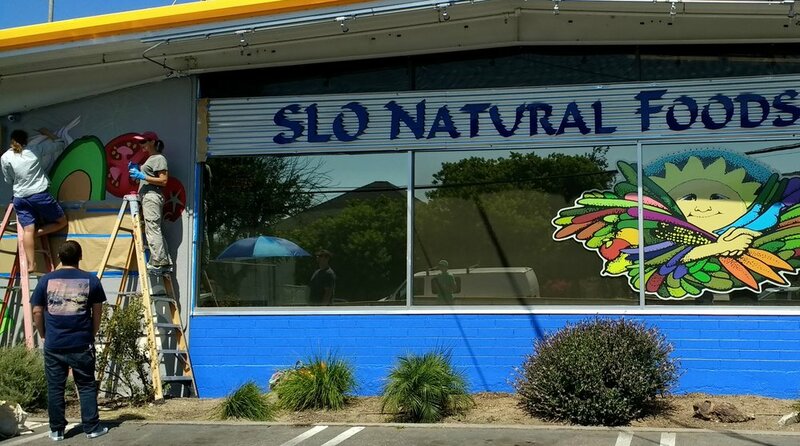 Sally Lamas and her crew of family and friends worked on the front of the store. We have new colors on the storefront as well as two murals of fruits and veggies on the front and side of the building. Sara McGrath coordinated the muralists for our back wall, where we had friends of all ages contributing their talents. Anne Wyatt cleared a lot of weeds and arranged plants for our seating area. Carl Meissner and Steve McGrath have nearly finished the work on the screening at the front entrance. Aimee Wyatt came early to set up shade and food for our volunteers and helped out with everyone during the day. There was also a lot of activity inside the Co-op! We were happy to host Virginia and Trevor Marum of Vert Foods and their class of nearly 20 people who learned how to prepare several different fermented foods. Be sure to visit Vert's website for info on their upcoming classes. In addition, we were glad to have Tammy from Gracious Greens here sampling her delicious microgreens. We still have some finishing up to do but we can't believe how much everyone accomplished together in only one day. We are so grateful to our generous and talented Co-op community. Thank you!